All in all, it’s been quite an experience. 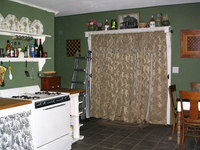 We started with a scary, rotted out back room and a dim little box for a kitchen. Now, we have a bright and airy kitchen space and a to-die-for pantry. And it only took……… about a year!!!! But we did lots of other stuff inbetween, so the timeline is not as bad as it sounds. As you may recall, we started tearing down the back room last spring. That was a major, major project – we got rid of 2 large dumpsters overflowing with debris, and had to carefully remove all of the clapboard siding so we could reuse it. Not easy or fun, but ultimately worth it because it matches the rest of the house perfectly. We rebuilt the back of the house and combined the two spaces into one large kitchen, with two new windows and a large set of salvaged french doors to bring more light in. 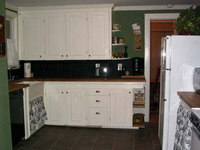 For budget’s sake, we left the existing cabinetry (and added some molding and new hardware so it wasn’t as ugly). Instead, we blew our budget on a new tile floor that looks amazing and hides all the dog dirt. 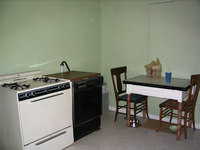 We also splurged on a new apron-front kitchen sink, which made the kitchen look really pulled together. But we desperately needed more counter space, so Teague ended up building some great custom cabinet pieces (like this) for the kitchen. One is on wheels so that someday when we get a new stove it can scoot over as necessary to fit it. Another hides our garbage can, which is now on a track – and I really love having it tucked away like that. Teague squared off the rounded countertop and used two pieces of leftover butcher block as shelving. I made sure the shelves were deep enough for my big cookbooks – so that someday, maybe, I will be inspired to actually cook. If you want to see additional photos, check out the Wagner Design and Construction showcase for a slideshow! Did you make the shelves above your stove? We don’t have a hood above our stove either, and I have been thinking about shelves, as well. I wasn’t sure if they would easily become dirty from the smoke, etc. from cooking. Have you had any experience with that? Hello neighbors, We also live in Canastota, NY. We are sophmores at CHS and we heard about your blog in the paper. In the class Design and Drawing for Production we are learning about designing and building homes, like yours. Our class wants to know if it is at all possible for our class to take a walking field trip to see the progress you have made on your home, because we’re all very interested and would like to learn more. Please call 697-2003 (the school) and ask for Joe Lasnicki. We hope to hear from you soon. We will see you aroung town!! The progress on the kitchen looks great. 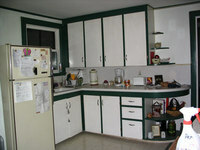 I was reading a great discussion on kitchen colors the other day on another blog. You should check it out here. They also have some great DIY tips. Good luck, it’s fun to track your progress.